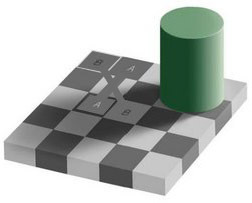 Physiological illusions, such as the afterimages following bright lights or adapting stimuli of excessively longer alternating patterns (contingent perceptual aftereffect, CAE), are the effects on the eyes or brain of excessive stimulation of a specific type - brightness, tilt, colour, movement, and so on. The theory is that stimuli have individual dedicated neural paths in the visual outer wall of an organism for the early stages of visual processing; repetitive stimulation of only a few channels misleads the visual system. Hold you head still and use your mouse to move the scroll bar up and down. Each of eyes contains an area that has no photoreceptors because it is occupied by the optic nerve. This area is known blind spot. These areas are on opposite sides of visual field. Following exercise is isolate the blind spot. Cover/close your left eye and look at the black cross (on the left). Move slowly towards the screen. The black dot disappears! Cover/close your right eye and look at the black dot (on the right). Move slowly towards the screen. The black cross disappears! Note that the dot is replaced, not by a black region, but rather blank white space. This is because the brain simply "fills in" the most probable stimulus (in this case, a uniform white area) where there is none. Look at this woman for about one minute then look at the empty box on the right. erase all pink dots from the image. You have two different type of nerve cells in your eye: rods and cones. 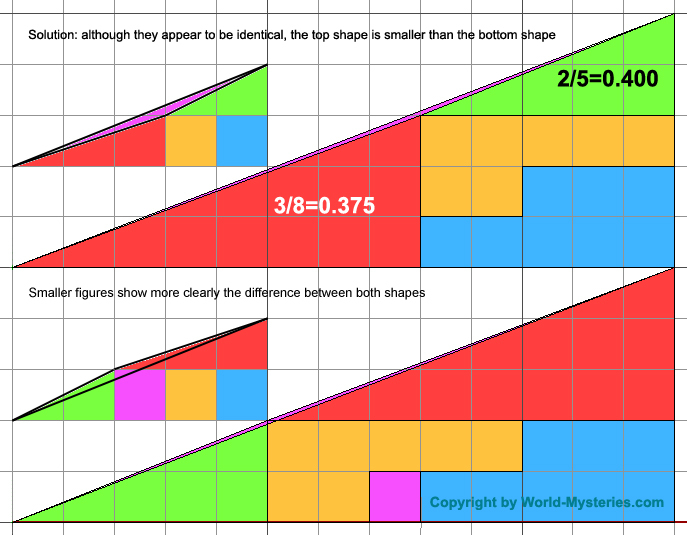 The cones let us see color, and the rods are very sensitive to shades of brightness. These cells, however, are not located in the same places in the eye. In the center of the retina, there are only cones, and no rods. Around the edges of the retina, there are less cones and more rods. The part of your eye that gives you the sharpest image is the center of the retina. So, if you see something out of the corner of your eye that you want to see more clearly, you need to turn your eye. If you stare at complimentary colors for a long time, your retina becomes tired with that color and causes optical illusions. 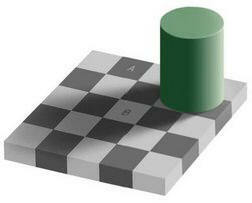 Square A is exactly the same shade of grey as square B.
that the two squares are the identical shade of grey. that appear to be the different shade of gray. Would you believe that gray ovals have the same shade of gray? 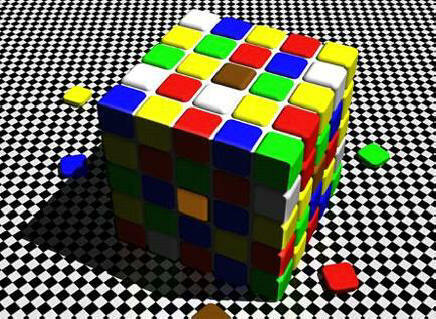 Notice the brown square in the middle of both sides of the cube. 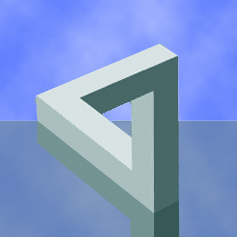 Although the front facing brown square appears much lighter than the top facing cube, they are really the same same color! Do you see the two shades of green above? There is actually only one shade of green. The black dots you see are fleeting, and any individual dot will turn white as soon as you focus on it. Clearly, all the dot are actually white, yet at a glance we still perceive some of them as being black. 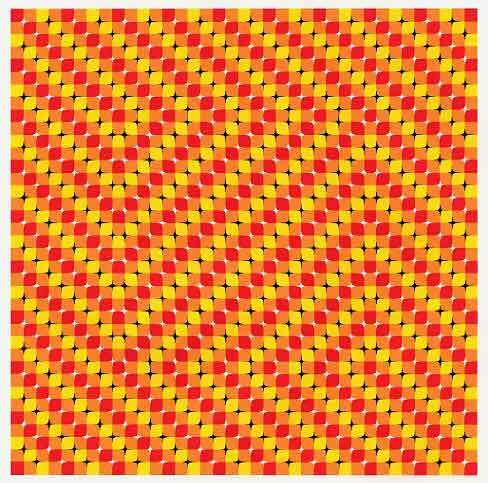 The unsettling effect seen in this image (called a Hermann Grid) is one of many optical illusions that take advantage of the way our visual system processes contrast information. Let's take a closer look at how it works. 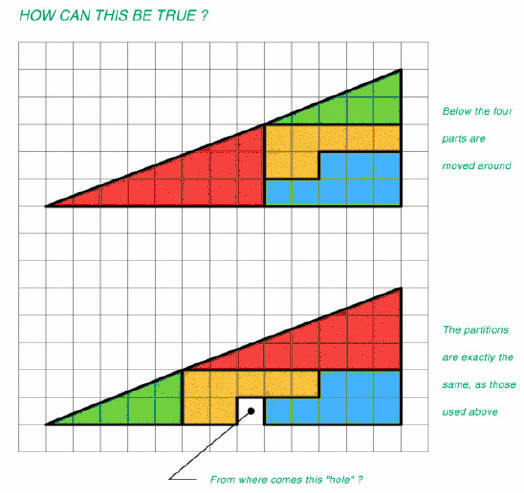 Why do we only see spots at the vertices? Why do the spots sometimes disappear when we look straight at them? A neural explanation of illusory spots in terms of receptive fields: u Some retinal ganglion cells pool information over many photoreceptors. Stimulation at the centre of a receptive field may have the opposite effect to stimulation at its edge. Perceived darkness of stimuli depends on what surrounds them. The effect depends on the size of the receptive field, the size of the stimulus, and what surrounds it. Mach bands can be understood similarly. 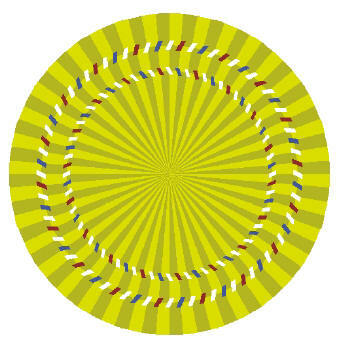 Stare at the center of the circle, and move your head back and forth towards the monitor and away from it. The circles appear to slide back and forth!